One of the powerful features of Zotero is collecting PDF. Zotero can save PDF, both from the web (online) and from the local storage (offline). Then Zotero can index PDF files collected so user can search them by text. Furthermore, you can cite PDF references as citation and bibliography. You can save PDF directly into Zotero library. Browse on the internet where you can get direct link to a pdf file. For example, a link like this http://ccmst.gatech.edu/wiki/images/6/62/Ccmst_workshop_1.pdf. Right-click on the link > Zotero > Save Link As Zotero Item. A new entry will appear in the Zotero interface. 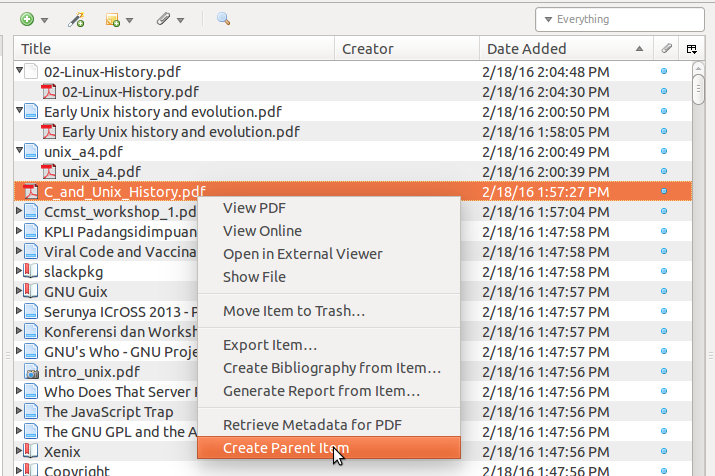 On the new PDF entry, right-click > Create Parent Item. If you have saved PDF files, you can enter them into Zotero. Open Zotero main interface (Ctrl+Shift+Z). Click New Item (green button) > Store Copy of File. By default, Zotero doesn't index the content of PDF files collected. So, user can't search for a keyword through all PDF collected. But Zotero has indexing feature and it needs user interaction to be enabled. Click gear button > Preferences > Search tab. There you will see information that PDF Indexing components are not installed. Click Check for Installer button to install the two components needed (pdftotext and pdfinfo from Xpdf project). On the Confirmation dialog, press Install button. While finished, you will get PDF Indexing section says pdftotext and pdfinfo are installed. Still on the Zotero Preferences, on the Search tab, click on Rebuild Index > Index Unindexed Items. Select one of PDF file in the library, see the properties information on the right panel. It should show Indexed: Yes entry. You may check another PDF files has been indexed or not. You can do text search through PDF files now.